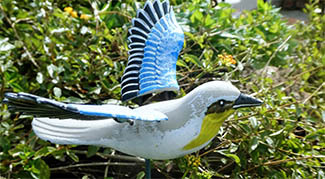 Our region contains a plethora of beautiful birds, trees, wildflowers, and wildlife. We encourage you to explore our local wildlife sanctuaries and parks. Whether you are a seasoned birder or a parent looking to delight their children with the wonders of the outside world, we have something for everyone. 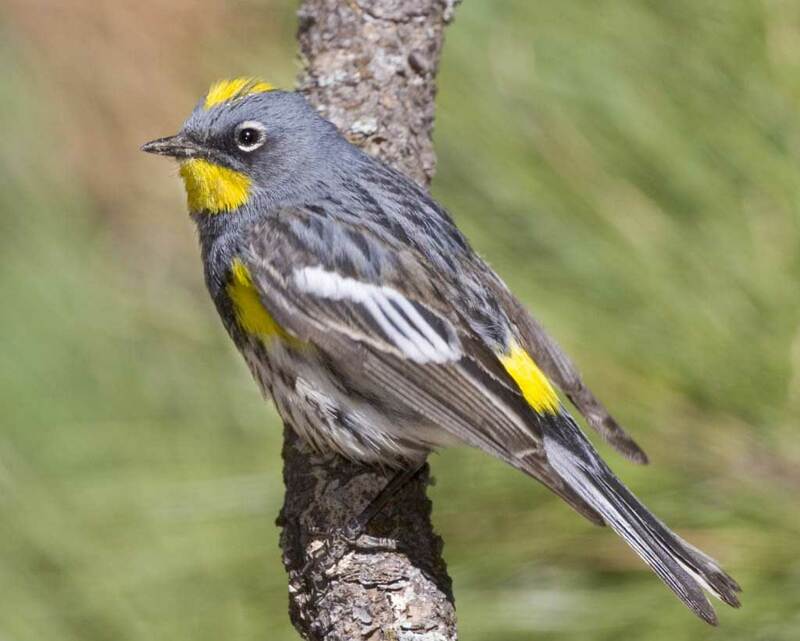 For over half a century, we have monitored bird populations in the Chemung Valley of New York and helped to conserve and restore the natural ecosystems in our region. But we think you'll want to join! All of our programs are free and open to the public, but our members receive special benefits. 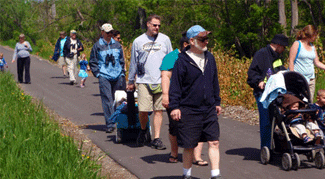 Nature Strollers, stroller-friendly guided nature walks for children and their families, returns May 10. To download the schedule, click here. Thanks goes to Chemung River Friends and Tanglewood for helping to lead these fun explorations through our local parks. We'd also like to thank Chemung River Friends for donating a 50 gallon rain barrel for the Gleason Wildlife Sanctuary. Rain water collected from the roof will be used to water the native plant pollinator garden. And we'd like to thank Tanglewood for letting us host our information booth there on April 20. It was great seeing all of you at the Nature Center! Won't you please take a minute to do this quick survey about our activities? Your feedback helps us to improve our Chapter. The survey will be available until May 31, 2019. Thank you so much for your participation! 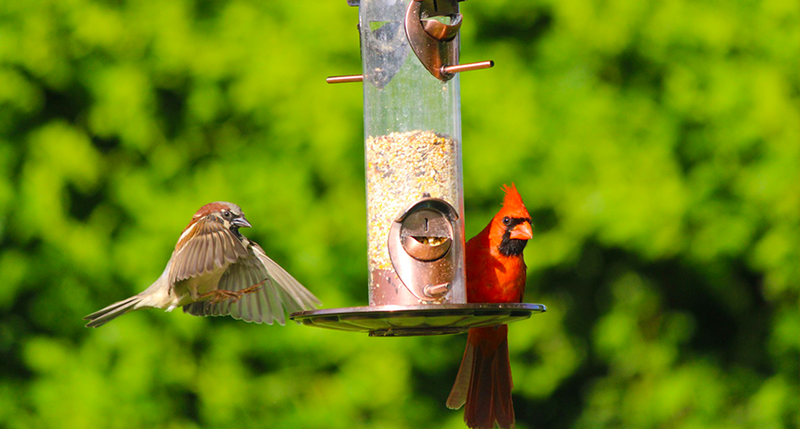 Check out these photos from local birder, Michele Rosenbaum! These are ospreys on the platform in downtown Elmira, behind the Waterboard building, taken the first week of April. 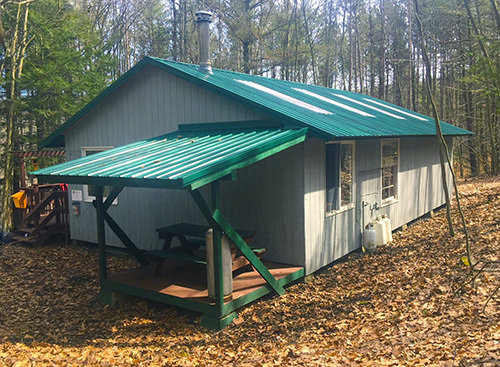 If you've ever had the pleasure of exploring our Northrup Hill or Gleason Sanctuaries, you may know that the Chemung Valley Audubon Society has a cabin in the Gleason Audubon Wildlife Sanctuary in Caton, NY, that has been used by the club for events over the years. The Ondura roof, installed over thirty years ago, was deteriorating, thereby allowing water to enter and damage the interior structure. Two types of planting styles are currently used for trees at Northrup Hill Audubon Wildlife Sanctuary: boundary planting and group planting. 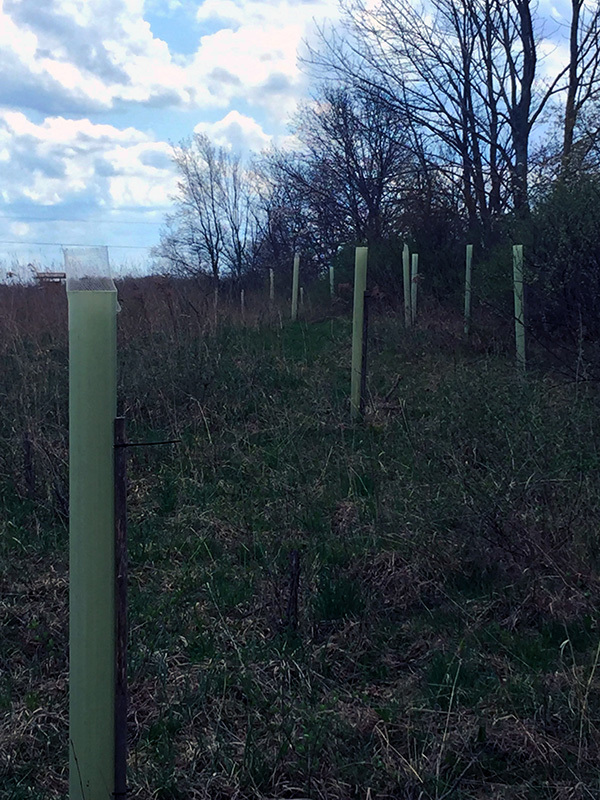 Boundary planting consists of trees which are planted in a straight line, giving definition to the property by providing a visual separation between one property and another or a transitional area between grassland/shrub land and woodlot. This transitional zone provides habitat for all wildlife. The margin of the northern field is a boundary planting with 20 Northern White Cedar, Thuja accidentalis, used for property definition in the upper field and a wind break. A boundary planting was used along the walking path in the first woodlot consisting of ten Paper (or White) Birch, Betula papyrifera, to add definition to the path. Along this path, notice fungi growing on stumps. 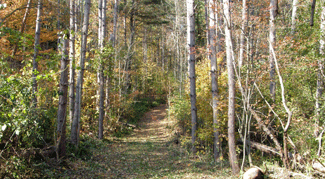 You will notice the second type of planting in the first woodlot. Sugar (or Hard) Maple, Acer saccharum, were planted using the group planting method. This experimental planting, which includes ten Sugar Maples, is copying Mother Nature’s dispersal method. When Sugar Maples disperse their seeds, they appear to helicopter and land in a circular pattern adjacent the parent tree. There are few Sugar Maples in this woodlot; accordingly, this experiment is meant to augment their numbers. In the following years, more Sugar Maples are planned to be group planted. Saplings are a favorite food for deer so most tree plantings are protected with a 5 foot tubular sleeve. Trees, protective tubes and stakes were donated for this project by Chemung County Soil and Water and by CVAS chapter member. Thank you to Brian Dugan for providing this overview of tree planting. In 2016, volunteers donated over 500 hours of their time for the restoration of our Northrup Hill Audubon Wildlife Sanctuary in Rathbone, Steuben County. 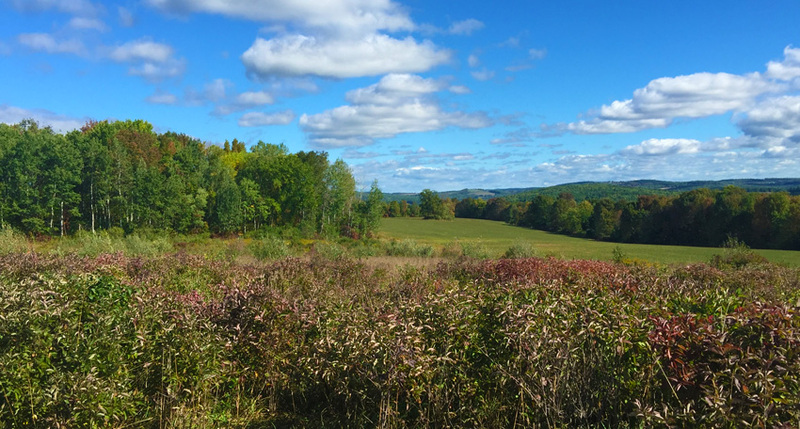 Our 30-acre preserve in the Town of Caton, NY, beckons to all nature-lovers with its dozens of tree species and hundreds of animal and flower species. 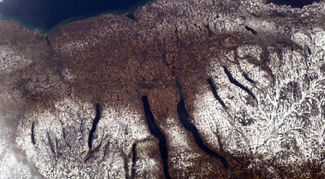 Chemung Valley Audubon Society will host Peter Robbins for a discussion of the geomorphology of the Finger Lakes. Meet in the Main Dining Room at Appleridge (Map), for a lively discussion about birding and a presentation from one of our knowledgeable hosts. A bird identification workshop precedes the program at 7:00 p.m.; the program begins at 7:30p.m. All are welcome to these free events. Bird Sleuth | A lively program for school-aged children that teaches key concepts, including diversity, adaptations, food webs, and more, through hands-on learning. CVAS Book Club | The CVAS book club meets on Thursdays. For meeting information and a list of the books we'll be reading, please click here. 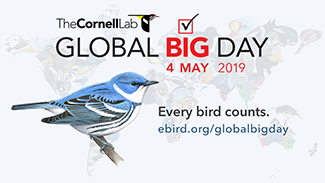 Last year's Global Big Day featured more than 30,000 people across 171 countries, collectively reporting 7,026 species of birds—about two-thirds of the world's bird species in a single day! This May, you can be a part of the fun. All you have to do is spend a few minutes birding, and eBird what you find. Bring birds and pollinators to your home today by growing native plants. Find the best plants for the pollinators and birds for your yard. Growing bird-friendly plants will attract and protect the birds you love while making your space beautiful, easy to care for, and better for the environment. Explore native plant resources here. It's that time of year again! Once again, we will be doing some spring cleaning at Mark Twain State Park. Please check out our I Love My Park Day page for more information about the projects we'll be working on this year, and how you can register to help. This event is great for all ages--check out the projects and pictures from last year! While any time of year is a good time to do something for the birds, it's finally spring, and therefore it's a great time to plant a garden, share your passion for birds with your family and friends, and make a difference for birds here, there, and everywhere. Visit Audubon and read about 10 Things You Can Do for Birds. It's here, and it's spreading! 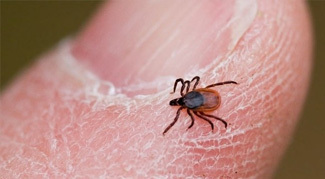 Awareness and knowledge will take you far in avoiding ticks and Lyme Disease during your nature exploration. 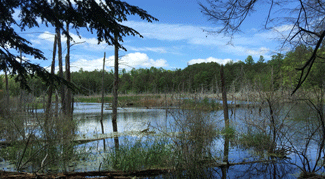 Chemung Valley Audubon Society is a chapter of the National Audubon Society. 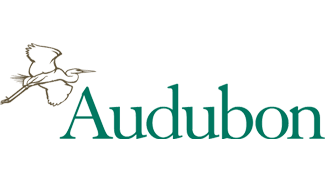 The NAS is an invaluable resource for any Audubon enthusiast. Donations from people like you keep our organization going. Our programs delight children and adults and bring the community together to provide the education, training, guidance, and passion needed to continue our mission. While it takes only a moment to donate, the impact your donation has on the work we do is long-lasting. We so appreciate every gift we receive! 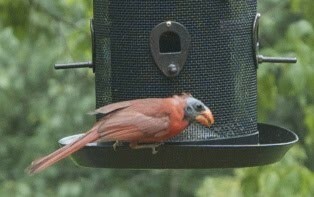 Bald birds, like this Northern Cardinal, may show up at your feeder during the late summer and early fall. "Bald-headed birds" are often seen in late summer. Usually they are grackles, jays or cardinals with a complete lack of feathers on their heads. While the rest of the bird's body looks normal, a completely bald bird certainly raises curiosity. The most likely explanation for the baldness is an abnormal replacement (molting) of all the head feathers at the same time. Others may include environmental or nutritional factors, feather mites, or lice. There is also some anecdotal evidence that a simultaneous molt of all the head feathers may just be a normal occurrence for a very small percentage of individual birds. Whatever the cause, bird banding studies show most birds recover from their period of baldness within a few weeks, and that birds recaptured in succeeding years often show no re-occurrence of this unusual molting behavior. For more information, check out the Audubon article here, which notes: "Because it is possible the baldness is caused by a nutritional deficiency, it can't hurt to provide nutritionally dense food in your feeders. 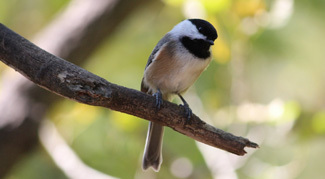 Ornithologists recommend never feeding birds food that is low in nutrition, such as bread or crackers, and instead suggest healthier options such as black oil sunflower seeds and peanut butter mixed with cornmeal." Learn about Tom Cade, whose captive breeding and release program at Cornell in the 1970s brought Peregrine Falcons out of a sharp decline from lethal DDT exposure. Cade founded The Peregrine Fund, the world’s most important raptor conservation organization. Read more. Meet at the Fitch’s Bridge Fishing Access, Hendy Creek Rd (State Route 225), West Elmira. Meet in the trailhead parking lot on Huck Finn Road near the entrance to the park and Murray Athletic Center on State Route 14. Please join us at Appleridge in the private dining room to discuss the book of the month. For a complete list of the books we are reading, click here. For families with young children, enjoy a leisure outdoor walk at various locations in Chemung County. An outdoor educator is on hand to help you enjoy the wonder of nature, and encourage your child's understanding of our natural world. For parents/grandparents/caregivers with babies in strollers, and walking toddlers, preschoolers, and young school-agers. Download the full schedule here. Meet in the parking area by Sullivan's Monument. This is a great place for warblers and other neotropic migrants. Meet in the Main Dining Room at Appleridge (Map), for a lively discussion about birding and a presentation from one of our knowledgeable hosts. A bird identification workshop precedes the program at 7:00 p.m.; the program begins at 7:30p.m. All are welcome to these free events. Descriptions for these events are on our calendar. Click the link above to view details. We have all seen the beautiful tropical orchids, but how many of you have seen any of the exceptionally beautiful native orchids growing right here in the wilds of Tioga County? 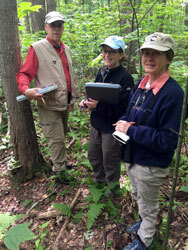 How many native orchids are there in Tioga County? Do they need conservation? If you would like answers to these and any other questions you may have regarding native orchids, come to a free presentation entitled “Conservation of Tioga County Orchids” at the Old Music Room, Wellsboro School Admin Building, on Wednesday, April 17, 2019 at 7:00pm. The best way to enter is to drive around behind the building (at the stop sign make a left away from the high school and follow the parking lot to the back of the building. You will pass the maintenance area as well as a sugar shack. Enter the building through the propped open door). Presenters will be Mark Simonis Tioga County Botanist and Chris Firestone, Botanist with the PA DCNR Bureau of Forestry. 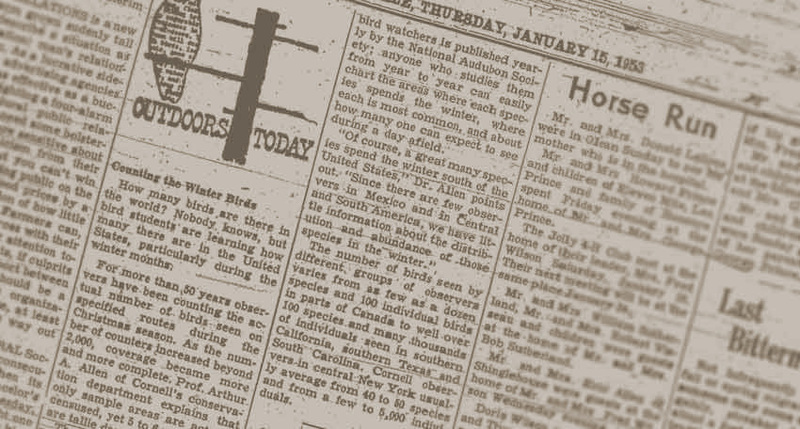 How many birds can a world of birders find in one day? You can help answer that question on 4 May 2019: Global Big Day. 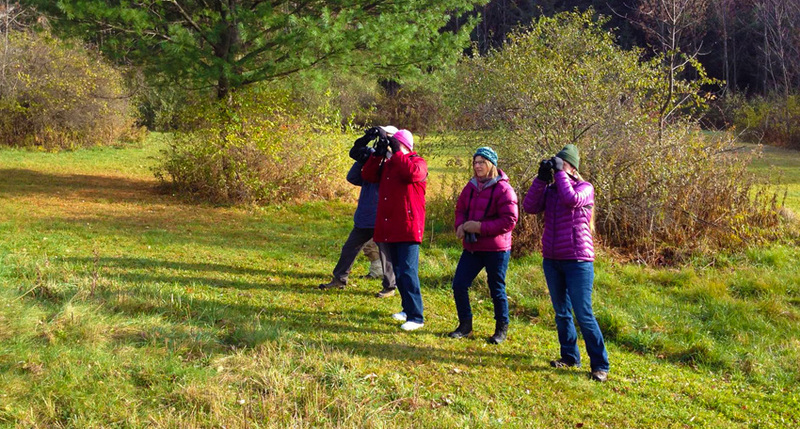 Suzanne Treyger, Forest Program Manager for Audubon New York, toured the Gleason Sanctuary and Northrup Hill Sanctuary properties to provide habitat and management recommendations. Now is a great time to tour these natural wonderlands. The bipartisan Bird-Safe Buildings Act was introduced on January 30, 2019, by Congressman Mike Quigley (D-IL), with reps Lee Zelding (R-NY) and Steve Cohen (D-TN) as co-sponsors. This legislation establishes guidelines for all future construction and alteration projects on federal buildings, where practicable. Senator Booker (D-NJ) introduced a Senate version in the last session of Congress. Read more here. "Bird-friendly solar arrays perfectly align with Audubon's mission to protect birds and the places they need, today and tomorrow," said Matthew Anderson, Audubon's VP of Climate. Read all about it by clicking here. American Kestrels and Barn Owls protect fruit farms from pests that damage crops. The avoided crop damage is enough to generate $2.2 million a year in additional revenue in one state. Find out which state by clicking here.